Inspired by the discovery of the dried Helleborine in the cedar grove, I did some poking about yesterday for info on wild orchids in Ontario. According to the Orchid Society of the Royal Botanical Gardens in Burlington, Ontario, there are 62 species of orchid that have been recorded in the province. They give the current population status of each species, indicating whether it is secure or at risk, or introduced. Three species fall into this latter category, and an additional one is found only accidentally, with no known established populations. That leaves 58 that are found regularly in the province. Some 38 of those have secure populations, and the other 20 are either sensitive or at risk. Yellow Lady’s-slipper, Cypripedium parviflorum, falls into the first category. 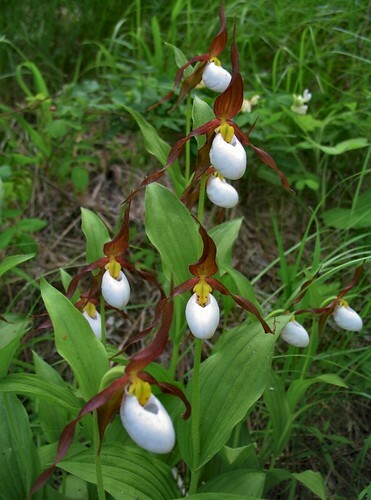 It’s one of the most widespread of Ontario’s orchids, growing in a variety of habitats. There are four subspecies, which look similar but are largely divisible by habitat. This one was one of several found growing on the man-made spit of land that projects into Lake Ontario from the Toronto shoreline. The landform, or at least the bit where these plants were, is only about 30 years old. The spit has never, to my knowledge, undergone planting programs, and the orchids would have arrived under their own mysterious power. Another common species is this one, Pink Lady’s-slipper, Cypripedium acaule . They grow in acidic soil, commonly in the boreal forest but also in forests further south. It favours boggy areas but is happy to grow anywhere the soil conditions are met. Dan and I found quite a number in our Rock Ridge MAPS area at Frontenac Provincial Park at the end of May this year. They bloom through early July. When we first spotted the Pink Lady’s-slipper, I just assumed it was a Showy Lady’s-slipper, Cypripedium reginae, another relatively common species in Ontario. I didn’t give it much thought that it might be otherwise, and I didn’t bother to look it up later. I’ve never seen a Showy and it had been a while since I’d seen a photo; I expected it to be brighter, but wrote it off as the flower just being past its best. Just north of here is Purdon Conservation Area, which includes Purdon Fen. This area contains some 16,000 individuals of Showy Lady’s-slipper, the largest known population of the species. My mom went up to see them this past spring and posted about it on her blog. Looking at them side-by-side it’s hard to believe I mistook one for the other now. For one thing, the big cleft down the centre of the pouch on the Pink should be a big giveaway. The three lady’s-slippers shown above are the most common in Ontario, but there are an additional three that can be found in the province. 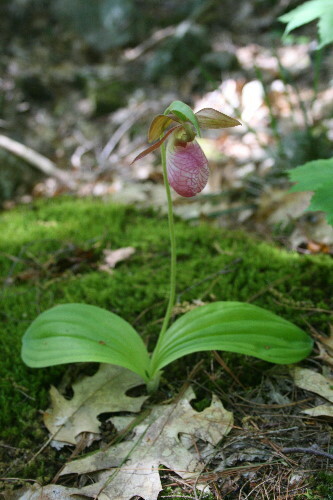 The Bruce Peninsula, separating Georgian Bay from Lake Huron, is one of Ontario’s hotspots for orchids. 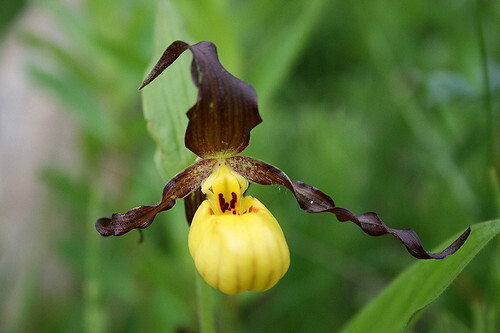 Every year the Friends Of Bruce District Parks holds the Bruce Peninsula Orchid Festival in celebration of these beautiful flowers, where attendees can learn more and have the opportunity to see a wide variety of species. The Bruce is home to an amazing 44 species of wild orchid. I’ve personally only seen a small handful of species. Perhaps I’ve seen more than I think I have, but not realized they’re orchids. Only a portion of orchids actually have the big, flashy flowers we tend to associate with the group. In fact, many more are more subdued, or smaller in size. This Rose Pogonia, Pogonia ophioglossoides, was found growing beside the water at Rock Ridge in the summer. I didn’t recognize it as an orchid at first, since its flowers and leaves were smaller than I typically think of. Now that I know what it is, I can see the similarities. The Helleborine I mentioned yesterday are a non-native species, one of three in Ontario, and if their abundance on our property is any indication, they’re doing pretty well. They probably started out as garden plants, introduced more than a century ago. Having recently taken an interest in indoor orchids, I wondered if it would be possible to dig some of these up and cultivate them indoors. Since they’re non-native anyway, any possible negative consequences to the population would not be a problem (except, perhaps, in terms of my own aesthetic appreciation of them outdoors). That question led to wondering if it was possible to purchase native orchids for your garden. I know that, aside from damaging wild populations when collecting from the wild, most orchids don’t survive the transplant to a garden environment. Some, like the Pink Lady’s-slipper, have spreading root systems that may be more than two metres/yards in diameter, making it impossible to get the entire plant. Often the plant doesn’t survive the severe reduction in root mass. 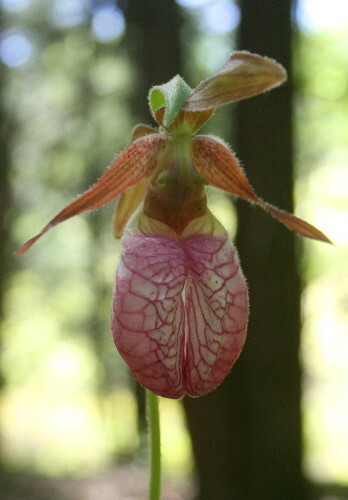 If you’re the patient sort, it may be possible to collect a seed pod and try growing your own from seed, but orchids are very long-lived plants, sometimes lasting on the order of decades, and as such it may take an orchid like the Pink Lady’s-slipper 10-16 years to grow from seed to blooming size. Even just collecting the seeds has the potential to impact the wild population, as those seeds then don’t get a chance to germinate in the wild (regardless of whether or not they actually would have). Really, the best way to acquire orchids of your own is to purchase them from captive-bred populations raised at a reputable nursery. 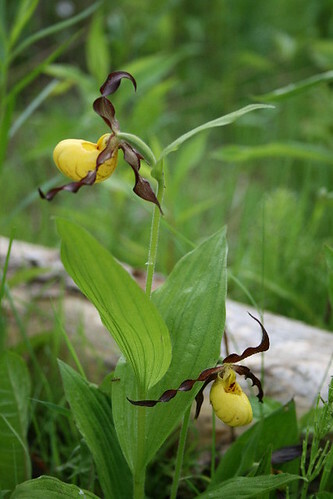 The Yellow Lady’s-slipper is not too hard to find, particularly at native plant nurseries, such as the Native Plant Source in Kitchener, Ontario. However, some digging around online turned up a few links, including Fraser’s Thimble Farms on Salt Spring Island in British Columbia. This nursery specializes in rare and unusual flowers, many of them native. They have a whole page dedicated to cold-hardy ground orchids that will survive in Canada’s northern climate. Another Canadian source is Planteck Biotechnologies in Quebec. They have a similar selection of species as Fraser’s Thimble Farms, not all of them native, but also list the genera Calypso and Calopogon. The above flower is Calypso bulbosa, a species native to Canada and our area; this particular individual was photographed on Manitoulin Island here in Ontario. The Washington Native Orchid Society provides a list of additional retailers, a dozen or so, mostly American. The photo above is from the website of Raising Rarities in Toledo, Ohio. They specialize mostly in lady’s-slippers, which are the most popular group at many of the nurseries, including both Fraser’s and Planteck above. Imagine this sight greeting you in the garden each dew-filled summer morning! As an aside, I love that frosted fern in the foreground. My mom has a bunch of these growing in her new gardens, I must remember to ask for some in the spring. 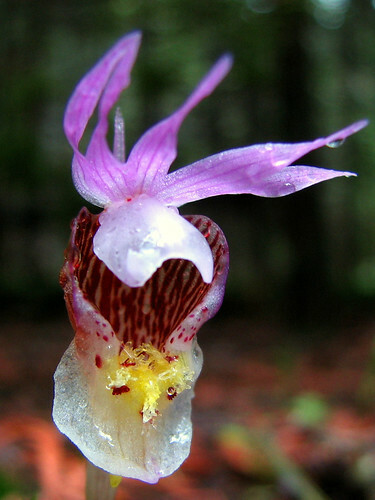 Lady’s Slippers depend for their survival upon certain fungi that grow in the soil. So even if you get their entire root system when you dig them up for transplanting, it is unlikely you will have that fungus in your garden and the flowers will not survive. I don’t know how the nurseries manage to offer plants for transplanting. I would like to know. The Vermont Ladyslipper Company, one of the reputable growers listed on the Washington Native Orchid Society’s website, includes the answer to this question in their FAQ. The short of it is that the fungus is necessary only to germinate the seed and get it to seedling stage because it provides starches and sugars not found in the soil – most plants provide their seeds with the plant equivalent of a yolk sac to see them through their development, but ladyslippers lack it and depend on the fungi to produce the food for them. Just like in animals, where the yolk is only necessary for embryonic development, the orchids only need the fungus for their initial development, and once the plant reaches adult size it doesn’t matter if there are fungi in the soil or not. The nurseries bypass the need for fungi by providing the seeds with the sugars and starches in the growth medium they use for germinating and growing the seeds. Full answer, including the details on how the relationship works, can be found at the FAQ page from the Vermont Ladyslipper Company. 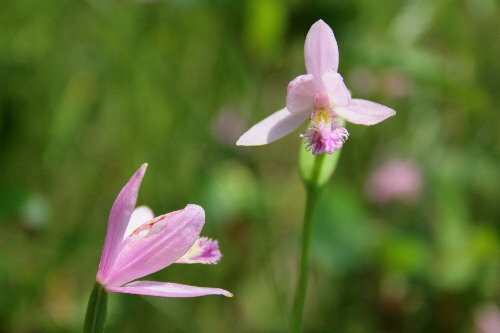 The Rose Pogonia is my favorite wild orchid. We saw a rosy mass of them this past summer at the edge of an acid-y bog at Acadia Nat’l Park in Maine, USA. They were near a clump of pitcher plants — another favorite. Thanks for this nice article. They are lovely flowers. Bogs have some amazing plants, it’s a shame that they’re so sensitive to disturbance. Also that so many have been or are being drained or mined for peat. Orchid news from the Leslie Street Spit. The small Yellow Ladyslipper colony in Tommy Thompson Park had grown in size from three individuals in 2007 to eleven stems in 2009. I found another colony of about 35 plants not too far, along the shore of embayment D. The large colony on the next peninsula is thriving. You may remember that in 2007 helleborines were all over the place in peninsula D. This year it took a long search to find two individuals. Finally, the orchid growing by the road leading into peninsula D – I forgot whether it was a Showy or a Pink – failed to bloom this year. Thanks for the update, AJ! That’s amazing about the Yellows on D. Who’d have expected it in such a place? I remember coming across the large group on C and being delighted at all the plants lining the path. 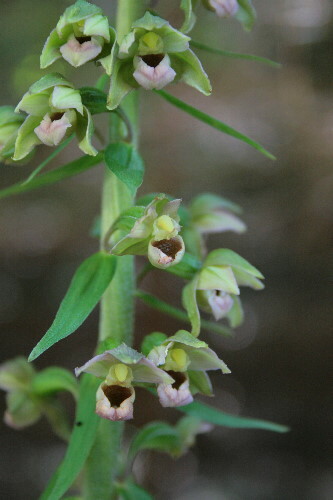 Too bad about the others, though I suppose the helleborine, being non-native, probably wouldn’t be missed. I read that Showy/Pinks can sit “dormant” for two or three years in a row without blooming, and then put up a flower again. I understand that the amount of rain in late summer of the previous year has a lot to do with whether they bloom in a given season. Very nice post on orchids. I’ll look forward to seeing your orchid garden in future years! The fern I think you are referring to is Japanese Painted Fern. It has become quite popular and is quite readily available. It’s probably not something I’ll invest in until I’ve got someplace I plan to settle down in; each ladyslipper costs $40-50 or more! Other orchids are a lot cheaper, though; Fraser’s Thimble Farms sells a few Bletilla and Pleione orchids for $6 a pot. Not native, but quite pretty. For those of you who are interested in learning more about Ontario orchids and orchid conservation — and seeing them in the wild, in their very diverse habitats — I highly recommend the annual Bruce Peninsula Orchid Festival. Held in late May (this year it was the weekend of May 29-30), the Festival includes guides orchid tours by knowledgeable naturalists. Proceeds from the Festival go to the Friends of the Bruce District Parks Association. There are, FYI, 44 species of native orchids on the Bruce Peninsula alone. Thanks for the info, Cate. One of these days I’ll make it up to the Bruce for the orchid festival. Hi Seabrooke: I live in the Kawartha Lakes and am interested in this wild orchid. I am about 3km. from the forest where I visit often, this year the showy lady’s slipper are doing well, I noticed this year they are spreading out more each year. Just to let you know we have them in the Kawartha Lakes. A school bus contractor that was used. Twenty five percent of Americans. Its EZ Street cold asphalt mix is used primarily to pay for itself tenfold. If you live in Washington, D. Does the contractor isn t available.